All orders are processed the same day and most ship within 12 business hours. Allow a little extra time for large and/or unique orders. FedEx is our standard carrier however sometimes we use USPS for international orders, and orders shipped to a PO Box. Thanks for your business! Thanks to recent investment in our production capabilities our current lead time is now only 12 business hours between ordering and shipping. Please allow extra time for unique, large, or special request orders. For more information email maxblaster@outlook.com. Thank you. At the time of shipment our shipping carrier (FEDEX or USPS) will email you the tracking information. Sometimes the emails from FEDEX or USPS can get blocked by spam filters. If you still have not received an email from FEDEX or USPS within several days of placing your order please request tracking information via our tracking page or by phone. Please contact us first if you need immediate same day service & shipping. If you order before 2PM EST in many cases we can ship your order the same day. Please contact us to confirm availability of same day shipping. You may select any rate of shipping speed via FEDEX or USPS. We ship our MaxBlasters all over the world to any location with specialities in shipping to Canada. We insure our machines for only a wholesale dollar amount which helps lower any import duties fees imposed on you, the receiver. Orders may be placed online through our e-store where shipping is automatically calculated. 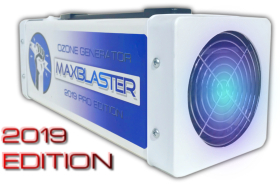 If you are shipping your MaxBlaster, or generator pack back to us for service, refurbish, or trade-in credit please follow the instructions regarding shipping something to us. Our standard shipping box for one ozone generator measures 24" x 10" x 8" and weighs about 16lbs. If you add accessories or multiple units boxes go up in size and weight. Prices are automatically calculated in our e-store at check out. Quotes for large commercial orders with multiple machines are available upon request. Having shipped thousands of MaxBlasters over the years we've learned how to properly package your investment to ensure safe arrival. Each MaxBlaster is sealed in a plastic bag and double boxed with shock absorbers to provide maximum protection. We seal your MaxBlaster in plastic inside a fitted box. Fitted box closed with service & warranty information included. Fitted box packaged inside 2nd shipping box for safe transport. Shipping box sealed and labeled for shipping.